Wow. 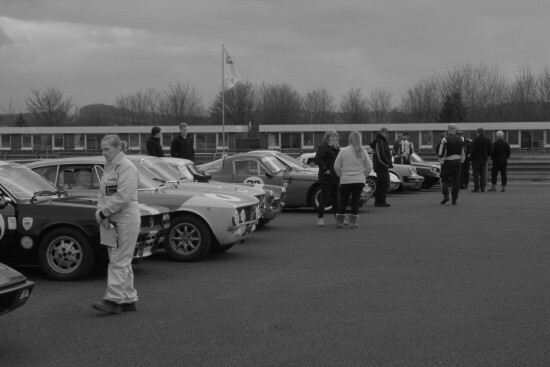 What a great bunch the HSCC are and terrific to finally enjoy our first outing racing with them. 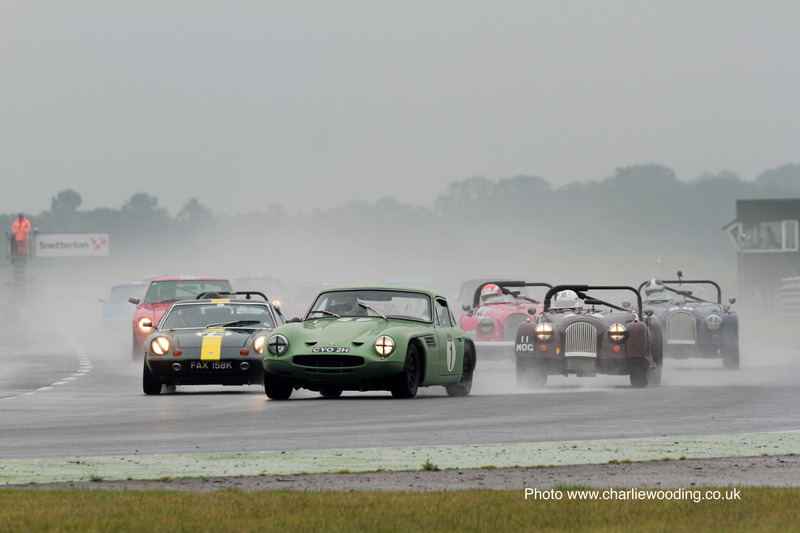 Welcome to 70s Roadsports Thruxton 2015. Testing on Friday was at its name suggests a challenge. The track was wet and slippery which for the fastest circuit in the UK with the fastest corner, Church; was a true baptism of fire. Our TVR 3000M was prepared and still fresh from the Great Western Sprint at Castle Combe circuit. We chose to stay on the Yokohama AD08Rs for the entire weekend, wet or dry, and without any other clues to the contrary set the cold tyre temperatures to 24-25psi. Wrong. A later online search pulled up an interesting entry on the manufacturer’s blog suggesting the ideal hot temperature pressure was 32-34psi, when ours never got above 29psi all weekend. Oh well you live and learn I suppose. Back to the testing test day and when one finds oneself out in a closed wheel session in the wet on the fastest track in the country and for the very first time to avoid low flying objects that shouldn’t be at Thruxton at all but arguably at Le Mans instead, one needs a large and purposeful race mirror and not the quaint original item sat in the middle of the dash. All I can say is thank goodness for blue flags. The only thing I had to be wary of in the end was if they don’t stop waving after one car has passed, it meant there was a second or third close behind. 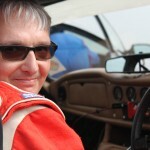 Testing on the Good Friday with help from fellow Bristol Motor Club member and seasoned racer Richy Marsh prepared me nicely for qualifying and the racing itself on Easter Sunday when the forecast was for it to be dry all day. It also allowed us to be scrutineered which was very useful because as it turned out there was stuff that needed doing on the car. The main item was the Accusump which despite personal beliefs to the contrary was not allowed in the cockpit. 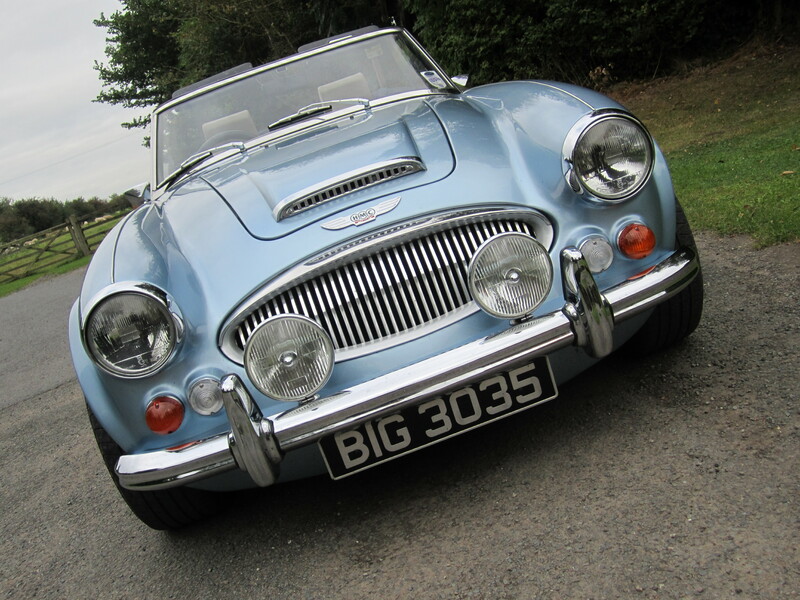 It either had to be moved or boxed in before we could compete in the 70s Roadsports Thruxton 2015 event on Sunday. We chose the latter and after Merlin Motorsport kindly provided sheet aluminium off-cuts plus that all essential race mirror, don’t leave home without one kids, plus Wickes the 90° aluminium angle, five hours later the Accusump was indeed boxed in. Returning Sunday morning and we were quickly able to find a space in the busy paddock and so we unloaded and got ourselves prepared. As a list person I had three. One to get everything loaded into the tow car and onto the trailer, a second in the form of an itinerary for the day itself and finally a list of things to check on the car before going out. Armed with list number three our small band of enthusiastic amateurs in the form of my wife Julia, son Alex and Brother Dan set about cleaning checking and tightening everything up. I did initially put myself in-charge of this but needless to say more important people pushed me down the order. Still it was absolutely brilliant to have them all along. 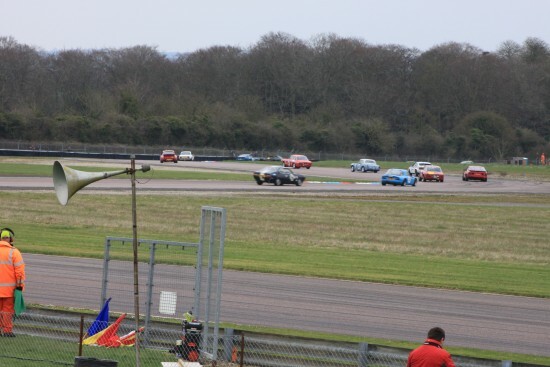 Qualification for 70s Roadsports Thruxton 2015 was excellent in that the track was now dry and with just fifteen cars out left plenty of space for a clean lap. 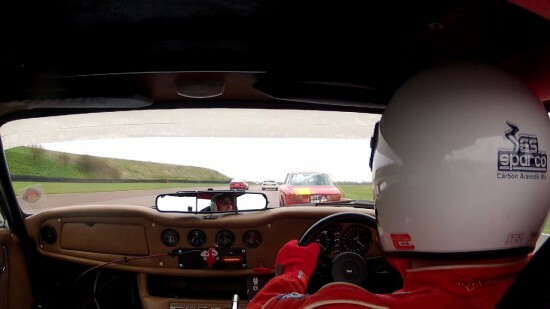 The race mirror was also superb in clearly identifying where other cars were which helped when turning into a corner. I knew the car behind had to give way but it is much more comforting to know where they are before going in towards the apex. In fact the time went by really quickly and in the end the results showed we had secured 8th spot on the 4th row of the 2×2 grid formation with now 13 cars still in the running. 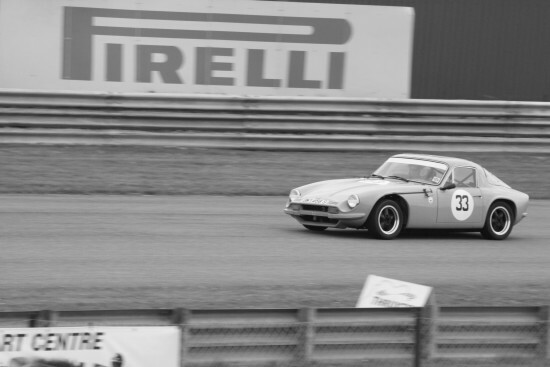 True the lead cars of Peter Shaw (TVR Tuscan) Charles Barter (Datsun 240Z) and James Dean (Lotus Europa) were a full 8 or 9 second up the road but they were, as it turned out in the race, also completely on their own. In the middle things were much closer with the potential for some very good battles between Alfa, MG, Lancia and our TVR. I also thought on reflection there was another 2-3 seconds in the 3000M exactly as it was with a braver drive, although anything better than that would require further investment in the engine compartment. All things considered a good start to the day and more importantly absolutely brilliant to be part of HSCCs 70s Roadsports Thruxton 2015 event. Which leads me nicely onto the race itself, and after the red lights went out, a moment of complete ineptitude ensued where I swapped my 8th on the grid slot for 11th place before we got into the first braking zone. That now meant from the 13 starters the race mirror had much less to do than before. What happened next is a bit of a blur. Some cars had problems whilst others were clearly out of place, being too far up the order and slowing the following pack down. 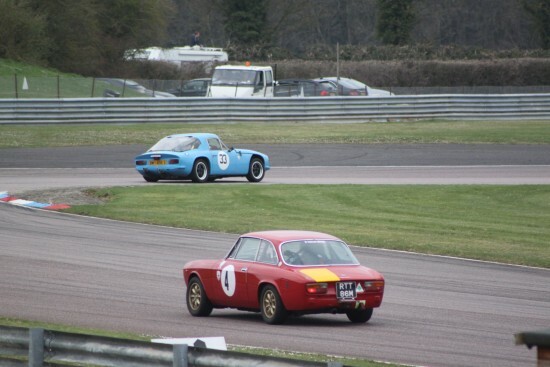 In the meanwhile Messer’s Shaw, Barter and Dean sped away on their own wave, followed by novice Will Leverett in his father’s ex-911SC whilst Dad Mark tried to keep up in his new steed, a Lotus Elan. However behind the first two groups making up the top five, things were a lot more open. David Karaskas (MG Midget) pulled up early after a superb start and strong challenge to ultimately leave Brian Jarvis (Porsche 924) ahead of Jon Wagstaff (Alfa Romeo GTV) who yours truly watched open up an impressive gap around Noble, Goodwood and Church each and every lap. Respect to those guys. Also included in this third wave of cars was Ken Rorrison (Alfa Romeo GTV) and Johan Denekamp (Lancia Monte Carlo) who had both made cracking starts, not forgetting Sarah Hutchison (Lancia Beta) and Neil Brown (Lotus Eclat). At times in the race I found I was on my own, making up and losing ground in equal measure to Brian and Jon, so almost like sprinting but with more laps involved and of course one eye on the mirror. Then at other times events unfolded which meant suddenly some overtakes were on the cards all before our leading trio hammered past with James now out in front, Peter second and Charles third. James powering past me first before Club with just one lap to go, Peter I opened the door to going into the chicane itself and Charles I completely forgot about and had to adjust mid-bend through Allard as he flew past with one hand on the wheel and the other raised to say thank you. All while I hung on through the same bend with both hands firmly trying to hang onto everything. How cool is he. The race ended as shown in the results table below and so well done to the top three but also to everyone else out there, it was great to share this space with you at HSCC 70s Roadsports Thruxton 2015. 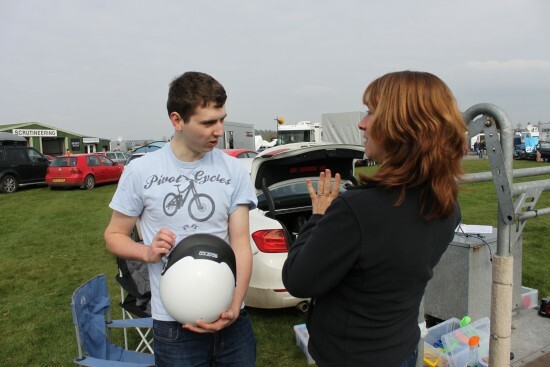 Next up for us will be Snetterton on the 13th – 14th June, can’t wait. With thanks to all the marshals who turned out, you make this possible. As a favourite meal: The chips sampled at Club Chicane whilst watching other races were cracking. 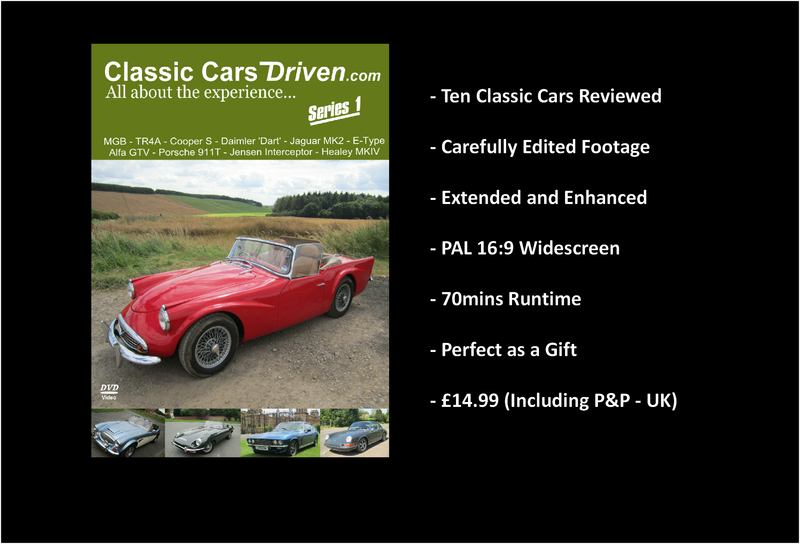 Anything Else: OK not everyone wants to race their classic but if you do feel inclined then take a look at what the HSCC has to offer for road going cars. Key Ingredients: Flat out and on a super fast track, being shown the way by others, any overtakes you manage and best of all just being out there doing it. Glad all went well,the TVR looks the business, you did well staying out of the grass. Congratulations finishing higher than you started, that’s the professional way to do it. Why are you trying to cut down the number of comments with a IQ test? Thanks Geoff, I enjoyed it and the car went really well. IQ test there to slow down unwanted spam messages to around 30 per week and not the 300 it was before. Necessary evil I’m afraid. Cheers, Matt. I was parked next to you( Sick Lancia),really glad you enjoyed your 1st race. A brilliant first race,and a lovely car as well. Thanks Mark, great to meet you. Is the Lancia OK…? Matt.